Chapter 1. When Was Canada? Figure 4.9 Iroquoian villages, including those in Wendake (a.k.a Huronia), were complex communities including large populations, longhouses, and defensive palisades, as well as farming operations. 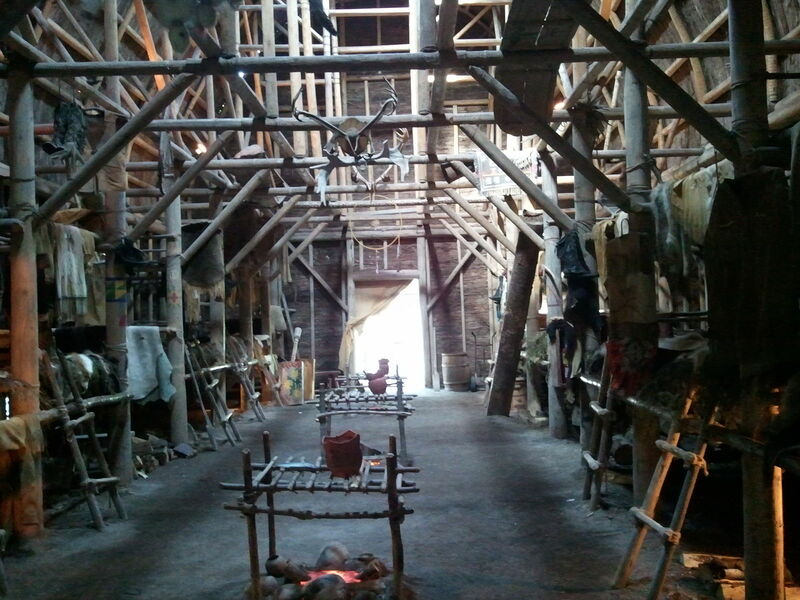 This is the interior of a reconstructed Huron-Wendat longhouse. One of the distinguishing features of Aboriginal cultures in much of what is now Canada is egalitarianism. This is a broad generalization but one that applies as much to hunter-gatherer societies as it does to sedentary agricultural societies. It was rare for a nominal leader in Aboriginal communities to be able to dictate direction or policy. Even when councils, which dominated the longhouse societies, reached decisions, these were not always binding on all parties. In Iroquoian societies in particular, efforts were made to develop consensus arising from discussion, but the record of the Five Nations, for example, shows many instances where one or more member nations went their own way. Individuals had similar options. In hunter-gatherer societies, leadership was as much a recognition of proven success in the field as it was of personality or birth. These cultural traits were not always understood or appreciated by Europeans. What might appear to outsiders as a political union was very often an arrangement subject to regular renewal and rejuvenation. The newcomers were accustomed to hierarchical societies headed by nobles and high clergy; not surprisingly they looked for parallels in Aboriginal communities and often mistook very different arrangements for “chiefdoms,” if not kingdoms. Errors such as these led the Europeans to assume, in some instances, that they could make treaties and pacts once and for all. Aboriginal peoples, however, put an emphasis on renewal and reaffirmation: they expected gifts and declarations of loyalty from one another in commerce and diplomacy and expected no less from their European trading partners. Some of these features were immediately obvious to sharp-eyed French leaders like Champlain, but not to others. Certainly European traders needed to take pains to conduct themselves according to local standards of commerce and not those of France, Holland, or England. Making that adjustment was often the surest course to success and profits, so there was a powerful incentive for the Europeans to get it right. And sometimes they did. In many tellings of the history of New France, Champlain appears to engage the largest Iroquoian-speaking nation north of the St. Lawrence and the Great Lakes in a trade and military alliance. In point of fact, the Wendat approached the French. The first few years of fur trading along the St. Lawrence involved the Algonquin and the Innu in particular. Both were acting as middlemen in their own right, trading goods that had been procured first by their neighbours, generally farther north. That middleman role was taken over by the more powerful Wendat. The French placed a premium on furs that had seen some use. Contact and wear removes the guard hairs from the pelt and leaves the fur glossier and richer looking — something that the French market preferred. This single fact gave shape to the fur trade. If the French had been interested only in freshly harvested furs, their influence would have spread much more slowly. One region would be denuded of animals, then another and another, sequentially. But the demand for used furs extended the trade out in search of stockpiles already held by Aboriginal families, bands, and communities. It created a series of funnels of trade that passed pelts out of one village or camp and into another and then another, coalescing finally in the hands of the ultimate middleman. From 1610 to 1649, that role was filled by the Wendat Confederacy. Wendat commerce has to be understood within its cultural context. The accumulation of goods was important and the Wendat were canny traders capable of manipulating supply and demand as needed so as to inflate prices from one season to the next. But wealth was acquired so that it could be given away: acquisitiveness and hoarding for personal use were frowned upon. Generosity and lavish gift-giving was a route to status in many Aboriginal societies and the Wendat were, in this respect, no exception. Although they traded for functional goods — materials that could be used on a day-to-day basis — they also sought luxury items and exotic goods that carried special weight as gifts. So long as the material needs of the Wendat household were met, trade would focus on goods that had the potential to elevate the standing of individuals or their families. This quality, too, was an asset as far as trade with the French was concerned. The novelty value of French goods could instantly be applied to the social competition that went on in Wendat longhouses. What was of still greater benefit to the French in their quest for large quantities of furs was the simple fact that the Wendat were sedentary. Their longhouses functioned as warehouses, too. Unlike the much more mobile and nomadic northern peoples, the Wendat could stockpile great amounts of furs and other goods in a way that no one else north of Lake Ontario could. The 1609 Wendat visit to Champlain’s habitation had two purposes. First, it was meant to engage the Innu (Montagnais) in a trade relationship that was already in place between the Wendat and the Algonquin nations. Second, the Wendat wanted to scout out the newcomers whose trade goods were already finding their way into Wendake (a.k.a. Huronia). To confirm the new partnership that now included not only the Innu but the French, the Aboriginal allies proposed a raid on the Mohawk village of Ticonderoga. Champlain agreed to participate, an important step toward a long-term alliance with the Wendat-Algonquin-Innu but also the initiation of a long history of enmity between the Haudenosaunee and the French. The Haudenosaunee (as discussed in Chapter 5) were engaged in an effectively endless series of raids and counter raids called the “Mourning Wars.” In Iroquoian societies the murder of a member was to be avenged by family; likewise, the murderer was to be protected by their family. Hostages were regularly taken, some of whom might be adopted into their host community as replacements for those who had died or had themselves been captured by the opposition. Captives in warfare typically faced highly structured public torture rituals aimed at testing their courage and endurance. In the absence of a police force and/or penal system these structures gave expression to Iroquoian understandings of justice and personal responsibility. Having committed to the northern alliance, Champlain had — probably unwittingly — inserted the French into generations of revenge killings and assaults. That was not his goal, of course. His purpose was to gain access to a lucrative supply of furs and in this he was successful. Wendake (Huronia) was 700 km of river route away from Montreal but it produced approximately half of all the furs traded in the 1620s and a substantial share even after the smallpox epidemics of the 1630s and the intensification of war with the Haudenosaunee in the 1640s. For reasons discussed in Chapter 5, Wendake (Huronia) failed to recover from the epidemics and was increasingly unable to defend itself from Haudenosaunee raids. The Confederacy was dispersed in 1649. By that time the French had established direct contact with many of the northern peoples and had trained dozens of men — coureur de bois — for the task of long-distance canoeing and North American commercial protocols. The loss of Wendake (Huronia) was, however, a significant blow to their Aboriginal neighbours who depended on Wendat corn in particular. The French, as an agricultural society, were able to absorb some of the demand for agricultural produce, a fact that would enhance their position in the fur trade after 1663. A final note on this phase of the colonial fur trade underlines the very important fact that the fur trade was utterly dependent on the engagement of Aboriginal partners. As the 1620s opened, there were fewer than 70 French residents in Canada. Until the 1670s this would not change greatly. Canada at this stage produced little of its own food, contained a handful of biological families, and the fur trade was its entire raison d’être. The fur trade required the exploitation and extension of networks deep into the interior of North America. That network depended on the involvement of Aboriginal traders and merchants, the most important to the French in this period being the Wendat (also known as the Huron) who called their confederacy and homeland Wendake (aka Huronia). Wendat diplomatic and commercial priorities along with their assets made them pivotal players in the early fur trade with Europeans. Reconstructed Huron Wendat long house by Neufast is used under a CC-BY-SA 3.0 license. 4.4 Wendake/Huronia and the Fur Trade by John Douglas Belshaw is licensed under a Creative Commons Attribution 4.0 International License, except where otherwise noted.